The Skybird Skill Book helper HD contains every in-game skill book in a simple-to-use, sectioned table system. 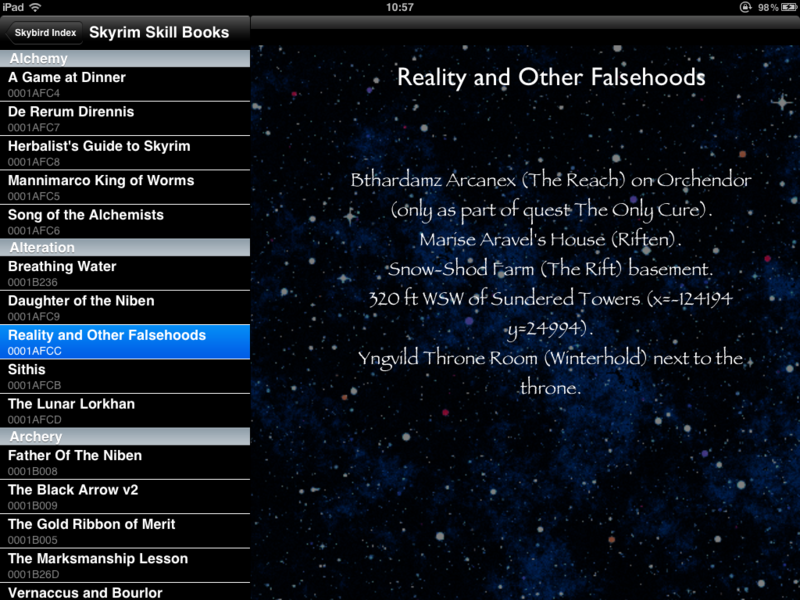 Once you have selected the Skill Book you want to find, the App tells you where to find it in Skyrim. Style 1 – general, the App will list those areas of the game where the book can normally be found, for those players who wish to explore and find the books without cheating. Style 2 – specific geographical co-ordinates. 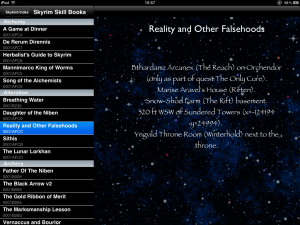 Using the co-ordinates of Skyrim, the App lists the exact location of the skill book. The player can then travel to the location using the in-game console. typing ‘cow’ (centre on world) in the console, then the world name, and the two co-ordinates given will teleport the player directly to that location. In addition, the table contains unique item codes for every Skill Book, which the player can use in-game to instantly create the book at the players location, using the in-game, drop-down console. Why miss out on a single skill book ever again?